Bleechr.com , an all football recruiting website, recently published a feature story on Jenkins Elite athlete, Ty Evans. The Bleechr Features focus on up-and-coming athletes, who continue to work tirelessly at becoming the best whether that is on or off the field. The article on Evans, written by Derrick McLead, summarizes his family background, recruiting process, and his offseason training. Evans, a rising senior at Palmer Ridge High School, committed to The University of Colorado as a junior, but has been offered by power house schools such as: Michigan, Texas A&M, Ole Miss, and Alabama. In January 2019, Ty will finish his senior season and be attending CU to kickstart his collegiate career. 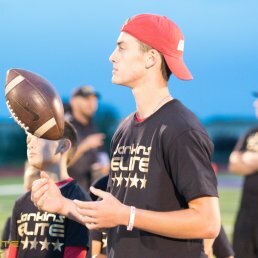 Evans trains two times a day seven days a week, with elite QB training by Tim Jenkins at Jenkins Elite. Tim, Jenkins Elite CEO, is a Colorado native, who made his name well-known in the Colorado high school scene and finished his career in the NFL and CFL. Tim experienced every phase from youth to pro athlete, which gives him the knowledge to help guide young players not only as athletes but as young men. The footwork and mechanical training Jenkins Elite has taught Ty over the last four years has prepared him to compete at the nations highest level. After a big summer competing at the Elite 11 and Nikes “The Opening”, Evans is hoping to finish his senior year with an undefeated season and another state championship title. Jenkins Elite is the country's premier authority in football development for youth, high school, collegiate, and NFL players.